No sign of the 'Eastern' Chiffchaff today, but one Marsh Harrier still present. The male Red-breasted Merganser, a Redshank, 19 Pintail and a Little Egret were also seen. An 'Eastern' Chiffchaff was seen at Bernard King hide today (it was first seen on Sunday). At least one Marsh Harrier was still present. Both Marsh Harriers were still present today. Other birds seen around the lake: three Chiffchaffs (Moreton Lane & Bittern Trail), female Greater Scaup (Villice Bay), three Water Pipits (Moreton area), Brambling (top of Sutton Wick lane), Peregrine (Stratford), and 100-plus Teal, 130 Shoveler and 20 Pintail. A second juvenile Marsh Harrier was present today; both birds were seen on a number of occasions over the south end of the lake. The new bird has a gap in its primaries similar to a bird seen at Shapwick Heath recently. Some more quality was provided by a first-winter Firecrest, trapped at CVRS this morning (their first since 1999). At least four Chiffchaffs were seen on the Bittern Trail around Bernard King hide this morning, and the male Red-breasted Merganser was off Nunnery Point this afternoon. 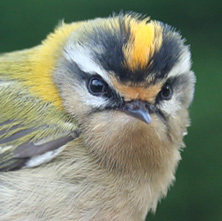 There was an unconfirmed report of a Firecrest at Bishop Sutton Tennis Club this morning. Firecrest in the hand (Alan Ashman). The juvenile Marsh Harrier was again seen over Herriott's End from Herriott's Bridge this morning. Four Water Pipits were in the Moreton area, and a Green Sandpiper was on Herriott's Pool. Still two Waxwings this morning at Blackthorn Way. The juvenile Marsh Harrier showed well this morning over the southern end of the lake, flying at close range in front of Stratford hide on one occasion. The male Red-breasted Merganser was on the Roman Shallows, and a Little Egret was on Heron's Green Pool. A Lesser Redpoll was in the alder wood behind Stratford hide. Three Red-crested Pochards (two males and a female) were seen swimming from Stratford to Moreton this morning, where they were lost to views amongst the reeds. The Marsh Harrier was still around again today. With a number of these on the Somerset Levels, it's perhaps surprising that we don't get more here; a wintering bird would be long overdue - perhaps this year? The Little Egret was still in Heron's Green Bay, and the male Red-breasted Merganser was in Villice Bay this afternoon. Two Mediterranean Gulls were seen in the roost, and another Daubenton's Bat was watched feeding over the water at Wick Green Point this afternoon. Nine Waxwings were showing well by the Friendship Inn this afternoon, flycatching from tree tops and feeding on a small bush in the car park. They also went over the road to the shopping centre car park at one point. The Marsh Harrier remained, being seen over the main reedbed this afternoon, and (unusually for a Marsh Harrier at Chew) was seen perched for the latter part of the day, in a sallow in the reedbed. The female Greater Scaup and the male Red-breasted Merganser remained, and a Peregrine was seen at the Starling roost over Moreton. Further unusualness was provided by the freshly ripped-up skin and vertebra of a half-eaten Grass Snake on the track at Nunnery Point - they're difficult enough to see alive at Chew nowadays! Gareth Jones has received the DNA results of the putative 'American' Herring Gull which was present during the summer. Seagull-botherers click here. A drake Ferruginous Duck and two Greater Scaups were seen today. All the good birds today were seen from Herriott's Bridge this afternoon; the Marsh Harrier on a couple of brief occasions, and an adult Ring-billed Gull on the pool before moving over to the main roost. Other birds from the bridge included six Pintail, a Mediterranean Gull, and a Peregrine, which took a Starling from the big roosting flock. The male Red-breasted Merganser was seen in Stratford Bay. The juvenile Marsh Harrier was seen again today, this time ranging over a wider area. The juvenile Marsh Harrier was again seen over the main reedbed (from Stratford) today. Other birds included the drake Red-breasted Merganser (off the main dam first thing), 43 Goosander (Hollow Brook), a Chiffchaff (Bittern Trail), five Pintail, 142 Lapwing, two Stonechats, a Water Pipit, a Little Egret and a Kingfisher, which, for a second time was watched perching on the open window of Stratford hide. A juvenile Marsh Harrier was the highlight today, seen over the main reedbed. There was an unconfirmed report of a male bird as well. This is an unusual winter record for Chew - normally they're only seen from spring to autumn. Also seen today were a Barn Owl (on the railing of the boardwalk behind Stratford hide), two Water Pipits, a Chiffchaff and 11 Snipe (Moreton area), 130 Lapwing (Heron's Green Pool) and two Stonechats. Three Chiffchaffs were seen on the Grebe Trail between the pond and Hollow Brook, and an 'Eastern-type' Chiffchaff was seen in the Hollow Brook car park today. The Little Egret was still at Hollow Brook this afternoon, and new-in was a flock of 56 Wigeon off Moreton Bank - nowadays there is little suitable feeding habitat for them at the lake, so double-figure counts are not easy to come by. A Kingfisher was again at Nunnery Point. Three Black-necked Grebes showed well on occasions this morning, despite the constant efforts of numerous twats sending their dogs into the water. Two were on the west shore, and one was between the sailing club and the Axbridge entrance. The Great Grey Shrike was still present this morning, ranging between Blackmoor and Ubley Warren. Obviously, the edges of Cheddar Reservoir are much more attractive to scarce birds than the edges of Chew, as this Black-necked Grebe proves once again. I'd never have got this close at Chew in a month of Sundays. Let's hope they all stay until spring and moult into summer plumage. Strong winds and heavy overnight rain have caused the water level to rise several inches since yesterday - Herriott's Pool and the shallower parts of the lake are brown as half of the Mendips seems to have washed into it. Stratford Lane was also flooded today. Meanwhile, the birds appear to have settled into the winter doldrums, with just the male Red-breasted Merganser, 28 Pintail, 12 Redpolls and a Siskin (the latter two in the wood behind Stratford hide). A Mediterranean Gull was seen in the roost. Still very cold, with most of the reedbeds frozen. A fly-over Siskin at Stratford and the female Greater Scaup at Moreton were the only birds of note. 15 Pintail were on Herriott's Pool. The feeders behind Stratford hide are doing some good business at the moment, though. 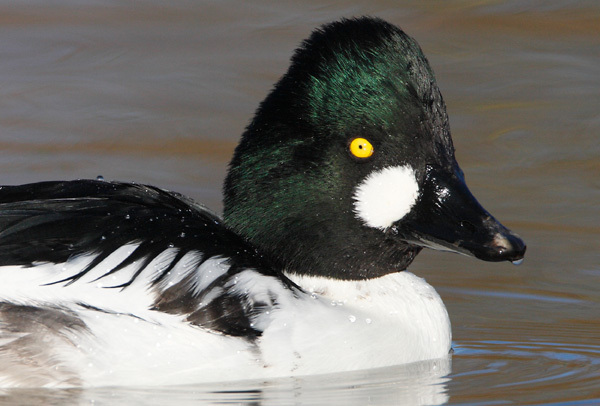 Normally right buggers to approach, this male Goldeneye has been giving splendid views at Herriott's Bridge, in the channel that feeds out onto the main lake. This was taken on Sunday. A fine, sunny day with several small patches of ice on the lake edges this morning after a very cold night. Predictably, there was no sign of the Velvet Scoters today, but the scarce duck theme continued with a female Red-crested Pochard in Heron's Green Bay. The last month or so has seen a good run of pretty decent waterfowl at Chew - three Great Northern Divers, a Slavonian Grebe, a Black-necked Grebe, a Red-crested Pochard, a Ferruginous Duck, eight Ring-necked Ducks, a Long-tailed Duck and two Velvet Scoters. I wonder if any Smew will decide to grace us with their presence this winter? Other birds today included a Siskin (over Herriott's Bridge), the drake Red-breasted Merganser (Villice Bay), a Green Sandpiper (Herriott's Bridge), 17 Barnacle Geese, a female Greater Scaup, four Snipe, seven Pintail and 32 Wigeon. A speculative attempt at finding a Bittern at Herriott's Bridge this evening produced at least three Daubenton's Bats feeding over the surface of the pool. 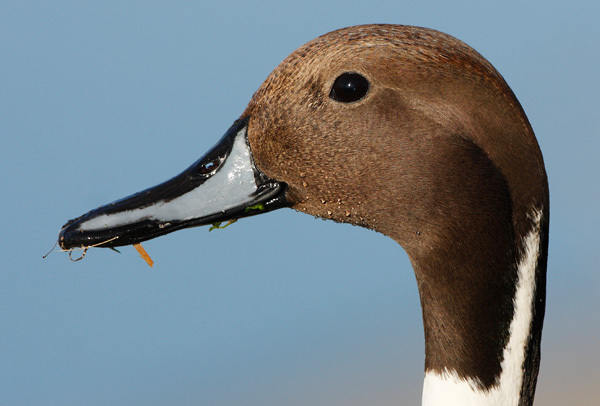 An unexpected bird at Heron's Green Bay today - this escaped drake Pintail came to the fence with the Mallards and puddle-ducks. Hot on the heels of yesterday's Common Scoter were two juvenile Velvet Scoters off Nunnery Point this afternoon - only the sixth Chew record, and a year (give or take a week) after the last ones. Two Mediterranean Gulls were in the roost, and a Woodcock was again seen over the Parkland at dusk, from the locked gate by the B3114. A female/juvenile Common Scoter was at Stratford this afternoon, whilst a close gull roost at Nunnery Point produced two Mediterranean Gulls. A Woodcock was seen in flight over the Parkland at dusk. Unless stated otherwise, all content and photographs are copyright Rich Andrews. Please if you want to use any of the pictures.